The golden hue of black and white silence and old-school charm. If you haven’t realized it yet, “The Artist” is a silent, black and white film, and it’s great. Our hero, George Valentin, was created in the vain of the swashbuckling Douglas Fairbanks, Sr. He is funny, charming, charismatic; he can do comedies, dramas, action-adventures; he has a wife, adoring fans, and a dog. The dog is star number 2, capable of playing dead or dancing in step with George. 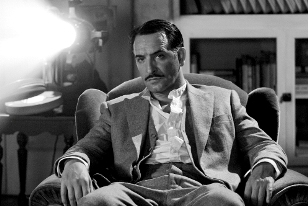 Jean Dujardin as George Valentin in Michel Hazanavicius's film THE ARTIST. An adoring fan finds herself absorbing the spotlight after a chance meeting with George. Not only can she keep up with him, but the world is ready to hear the voice of Ms. Peppy Miller. She is not named “Peppy” by accident. We have a delightful story of love; love of success, love of movies, and love between George and Peppy. Dujardin has a wonderful comedic touch to everything he does in this movie that the simple story line is helped along with a healthy dose of comedy. He turns serious when The Great Depression hits, but “The Artist” keeps chugging along with its original, uplifting score, inventive scenes, and a finale that brings us into the future. Midnight in Paris (2011) - The magic and romance of Paris in the 1920s.